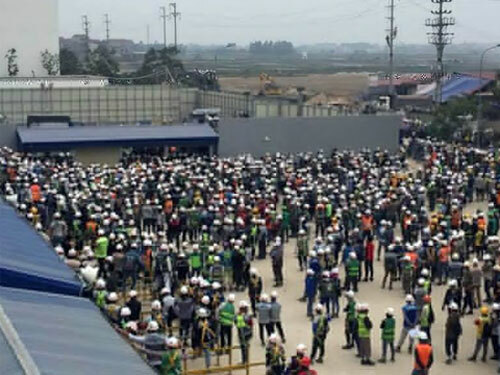 Tuesday 28th February – at the Samsung Display1 plant in Yen Phong Viglacera industrial park, Bắc Ninh Province, hundreds of workers rioted and more than a 1,000 gathered outside the company later after a worker was assaulted by a security guard after lunch, at around 13:00. "The guards pulled him into their room and there was a fight. Many other workers were angry and chased after the guards"
Workers fought with Samsung security. Crowds grew, and soon more than a thousand had gathered outside the Samsung display factory. After a couple of hours, police arrived at the scene, and after some clashes, crowds were dispersed with police calling on the workers to return to work. Bắc Ninh provincial Police Department assigned some officers at the company, to help Samsung security guards maintain order and investigate the troublemakers. A Samsung security guard was hospitalised. 1. Samsung Display is involved in the manufacture of screens, such as OLED displays and intends to invest $2.5 billion in Vietnam. With this, total investment in the country will reach $6.5 billion, and is expected to increase the plant's annual production capacity by just under 25%. Translation into Dutch, see Arbeidersstemmen. Great write-up, thanks for posting!